So much of good coaching and teaching is being organised ahead of the lesson. Here is what I did in red/ orange lessons this week with beginner to improver players. You always need to start with a really good warm up that is simple to deliver and strikes a balance between getting the children ready to play and focus but at the same time not too excited. I set up cone ladders on the court as per pictured to do some footwork and asked them to do a split step at the end of the ladder. To do this I put down a throw down line at the end in a vertical position and asked them to do a little jump with each foot landing on either side of the line. I spent 2 to 3 minutes on this as I would return to it later. 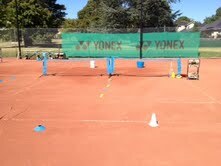 After this I moved the children to the main court area where I had them overarm throwing to targets on crates/buckets. 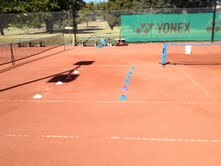 I colour coded the throwing to encourage cross court placement without having to tell them too much. This was followed by some individual racket and ball skills encouraging rhythm and contact with the falling ball. By this time, I could run a feeding situation whereby I combined exercises one and two. So they ran through the ladder, split stepped at the top and hit a falling ball fed out to the side of their body. It is important to always incorporate some aspect of the lesson that feels to them like 'real tennis' so I put them into pairs and had them working on rallies whether that meant one throwing and one hitting or both hitting. In between basket feeding, I had asked the children to practise throwing balls into the buckets or trolley as a fun means of collection which is a good way of teaching them how to feed gently. Differentiate as appropriate. If I had time I did another drill where I asked them to swing for a long target and then fed a short ball and asked them to drop shot it to a short target. This was usually points related. I do this as at beginner stage because they may get the moving, the split step and contact with the ball, but they will swing with no concept of a court in mind. Targets and points focus them in this way. I repeated the rally activities in pairs again, asking them to start a rally/ point with an overarm diagonal throw or serve.. It is a long journey with the athletic development 5 to 9 year olds and it is better to stop early while they are enjoying an activity than try and run it to death. I like to leave them wanting more and make time for a fun game that is tennis related if possible. I try not to give too much instruction during the lesson unless completely necessary preferring to encourage good performance and show them quickly how to do something and let them start. I will stop a drill if necessary and make some general points but feel that is better most of the time to remember that perfection can't be achieved in the course of one lesson. It is better to repeat the drill again in the next lesson and aim for improvement through incremental repetition over a period of time. As for the older ones, that's a different story. More later. Well done coach!!!! Cannot wait for next lesson !! !